DailyDOOH » Blog Archive » Can The #NECshowcase Get Any Better? Sticky: Can The #NECshowcase Get Any Better? The problem that the organisers of yesterday’s #NECshowcase face (NEC Display Solutions and Simon Jacksons’ management team) is exactly how they can top the event next year! There were 1300 pre-registrations and we believe (though we have NOT been told officially) that there were likely 870 or so who turned up on a very wet and windy day on the far side of London. That’s a good turnout and anyone who was there will tell you that the event was extremely busy – crowded even in some places. Did I tell you about the time I rescued a dog? Despite some views to the contrary it was likely that NEC’s partners themselves managed to beguile enough end users (many of them blue chip corporates) to attend. Our rough and ready reckoning (looking at name badges, sneaking a peak at the confidential attendee list) was that 50% of those in attendance were not suppliers, partners or employees. 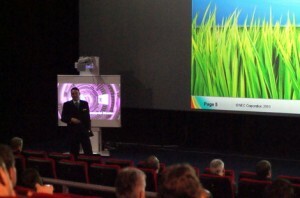 It was great that The Screen Forum were roped into arranging briefings in the morning and afternoon – it was a slight shame about the quality of the AV (some Microphone problems and err always made worse when attendees are ostensibly at an AV event). Anyway, there were some great speakers and some good topics and it broke up the day of walking around nicely for many. We hope that is repeated in future years (perhaps with just a little more love and care on the AV side of things). Dirk Huelsermann’s VUKUNET presentation in the afternoon was probably the most talked about. He’s a regular presenter and so it must be hard for him to keep the presentation fresh but he duly obliged and showed a whole new slide deck with historial outdoor advertising references that got people interested from the outset. VUKUNET re-announced their deal with Waterworks earlier that day and though these guys are talking a good story and seem to have lots to say, they now need to demonstrate that they can deliver (there are rumours mind you of even more networks signing up and we are expecting a number of announcements pre-#ScreenmediaExpo). We joked about “No Riff-Raff” in a post yesterday and it was surprising to see some individuals who we know were blacklisted still sneak into the event (we won’t name and shame them but we probably all know who they are). No doubt one of the things that makes the #NECshowcase so good is their attention to detail – rare in many corporates these days as employees simply just-do-their-job (remember last year’s Pink Floyd playing at the event at Battersea Power Station?) anyway, one look at how good the NEC brochure for the event was will demonstrate just how professionally everything was planned. The brochure here (as a PDF) is well worth a look and would make many exhibition organisers weep. What wasn’t to like? Well the O2 is away away for some people and so something more central would probably be nice, the venue is also not conducive to good photography (witness some of our own photos and the NEC photos up on Facebook) and we still think that a (corporate) event such as this needs a ‘creative director‘ to give direction to almost all of their partners; exhibit (a) M’lud was Hiperwall which is a great product but the content shown never seems to demonstrate how good a solution it is – and just in case you think we are picking on Hiperwall they were far from being the ONLY exhibit / exhibitor that could have done a much better job with content. And lastly whilst we have given great credit to Simon Jackson (and his team in the UK) we really ought to tip our hats to the Germans (yes I know, I’m sorry BUT come May 19th I am sure we will show them). Nine years ago in Munich NEC Display Solutions’s Vice President Marketing & Business Development Stefanie Corinth came up with the idea of building an eco-system around their offering and got the ball rolling with what (elsewhere in Europe, outside the UK at least) they call an NEC Competence Days – Simon has taken that basic idea and ran with it and created an NEC event pretty unique in the display industry. There was a rumour that some senior managers from Extron were in attendance AND after pulling out of ISE and InfoComm they may well want to do something similar to the #NECshowcase. Trust me, there would be no better place to learn how to do that professionally than from an event such as this. Wunderbar as they say in Deutschland, Wunderbar! This entry was posted on Thursday, April 26th, 2012 at 10:09 @465 and is filed under DailyDOOH Update. You can follow any responses to this entry through the RSS 2.0 feed. You can leave a response, or trackback from your own site.